Royal Society of Chemistry’s Research Poster Twitter Competition! On Tuesday 6th March until Wednesday 7th March (9am-9am), the Royal Society of Chemistry (RSC) ran its annual online conference poster competition; an exciting event held entirely on Twitter to enable members of the scientific community to come together electronically to share their research, network and participate in scientific debate. To take part, researchers were required to simply tweet an image of their poster along with their title, #RSCPoster, and the most appropriate subject category hashtag (as shown above). …and as a result, their posters received a great deal of attention and support. Even after the event, all Loughborough entrants received multiple questions, retweets and likes from Twitter users from around the world – it certainly showed that chemistry research at Loughborough is thriving! After the event, the conference organising committee selected posters which enthused wide interest and highlighted innovative research. In addition, prizes were given based on content and accessibility, design and interaction with other Twitter users. 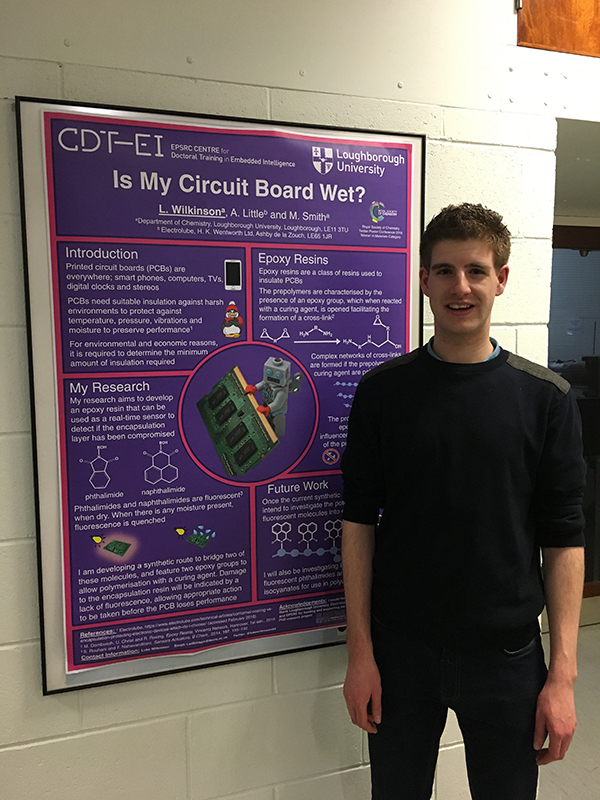 We were delighted to learn that Luke Wilkinson (as shown in the photograph) won 1st prize in the materials category and not only was he awarded £100 and a certificate, but he also received a bespoke Errant Science cartoon abstract of his research! A huge well done to Luke and all those that took part!